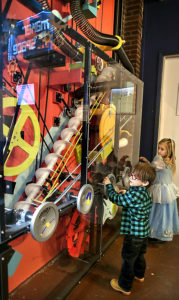 As a nonprofit organization, the Children’s Museum benefits greatly from the generosity of those in the community so that we can continue to serve all of our visitors above and beyond their expectations. A donation in any amount is always appreciated! The Children’s Museum is a registered 501(c)3 nonprofit organization. 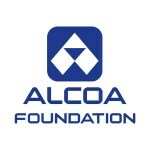 All donations are tax deductible to the extent of the law. You can make a donation directly to the museum through PayPal via the “Donate” button below! We are currently working on a Corporate Sponsorship program. Stay tuned for more info. The Endowment Fund is specifically designed for the future, both from the points of view of ongoing support and planned future giving. While the Museum will continue to solicit support in its annual appeal for funds to be extended in the short term, we encourage our supporters to secure our future by including the Museum in their estate planning. Our Quasi-Endowment Fund has been established with First Columbia Bank & Trust Co. and has already received significant support. We welcome your support through a variety of gifting methods in accordance with our Gift Acceptance Policy. This policy is available for review along with a more complete description of our endowment fund by calling our office and speaking with a representative of the Museum. The Museum is important for the future of our children. We encourage you to provide gifts that assure the future of the Children’s Museum. Why Do We Need Endowments? With your help, we will realize our Museum of Tomorrow. Your gift helps to continue and expand a foundation on which to ensure stability and programming excellence in the sciences, arts, and humanities. It is a gift that keeps on giving, allowing the Museum to serve the children of our community and the region for years to come. For us to build our future, we will need gifts of all sizes. Gifts are pooled in the Fund and have a cumulative effect in making even the smallest gift significant. Every gift contributes to the overall growth of the principal, which increases the return on investments. Gifts of Cash: Simplicity and ease of giving are the reasons that cash is most commonly given to endowment funds. Gifts of Stocks and Bonds: A gift of publicly traded securities may entitle you to an income tax deduction for the full market value of the securities as of the date of the gift and also may eliminate any capital gains tax you might incur if you sold the securities. Our fund administrator handles this type of transaction. Gifts of Real Estate or Other Tangible Property: Gifts of other than cash and securities, either to be given now or as bequests, may or may not be able to be accepted. If you are considering such gifts, you should consult with the Museum during the planning process. Gifts of Life Insurance or Retirement Accounts: You may designate the Museum as a beneficiary of your Life Insurance, IRA, or 401(k) retirement account. A Personal Will: You may designate a bequest to the Museum as a specific amount or as a percentage of the value of the remainder after other bequests. Note that bequests of other than cash should be discussed with the Museum during the planning process to see if they are applicable. Yes, your gifts to the Endowment Fund are deductible for federal income tax purposes to the extent of the law. Bequests, legacies, and all gifts of value are generally exempt from federal estate and gift taxes. 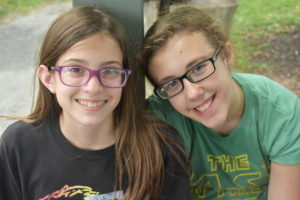 Our Endowment Fund Committee can provide information to acquaint you with the various types of gifts, trusts, and funds that are available through our Planned Giving Program and will be happy to answer your questions. Please contact the Museum for more information. *This page contains general gift, estate, and financial planning material for informational purposes only. It does not provide legal or tax advice. For advice or assistance on specific gifts and decisions, please consult an attorney or other professional advisor before making a commitment. 10% discount on Classes, Camps, and Clubs. Invitations to attend museum gatherings, special programs, exhibits openings, etc. Most important of all you will have the distinction of investing in a child’s excitement for learning about the world they live in and caring for their world in the future. Check out the Friends of the Children’s Museum brochure for more information. As a non-profit, The Children’s Museum depends on volunteers! We are always in need of volunteer help, so don’t hesitate to contact us to learn more! Here are some suggestions for volunteer work you can do with us! Help us with office tasks, stuffing envelopes, answering phones, and working at the front desk helping people check in and purchase items from our gift shop! 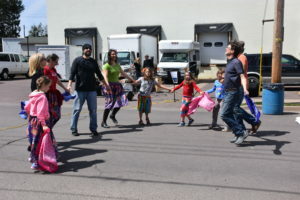 Help us publicize museum events or increase support for the museum through fun events! 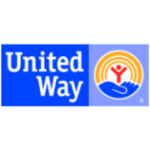 Work with children by teaching or assisting with a program. You can also write a teacher’s guide. 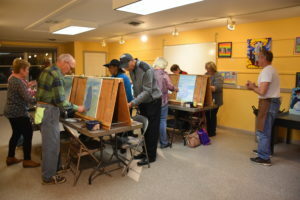 If you have a special talent or interest that you would like to share (be it art, music, science, or just about any other talent), you can do a regular presentation for groups or a single Saturday general program. Pick up an application at the front desk, fill out an application from our website, or contact museum director Shawna Meiser and we will email one to you! Applications are accepted at all times and will remain on file. Volunteer applicants will be interviewed and placed or positioned according to the Museum’s needs and the volunteer’s skills and interests. Contact us to inquire about volunteer opportunities today! Do you love getting kids excited about learning and the world around them? At The Children’s Museum you can bring the exhibits to life by volunteering as a docent. Our docents serve as an exhibit guide or program facilitator for our young guests during group visits. If you are knowledgeable in another area or have an idea for a specific activity or lesson, we will be happy to work with you. All new docents receive training materials and are introduced to the presentation process through a quick and easy orientation. Please fill out an interest form or contact us to learn more. Academic internships are available during Fall, Spring, and Summer semesters for university students who are currently enrolled and are seeking academic credit for a professional museum internship experience. Some fields that work well with our internship program are: Art & Art History, Anthropology, Communications/Marketing, Education, Biology, Engineering, and History. 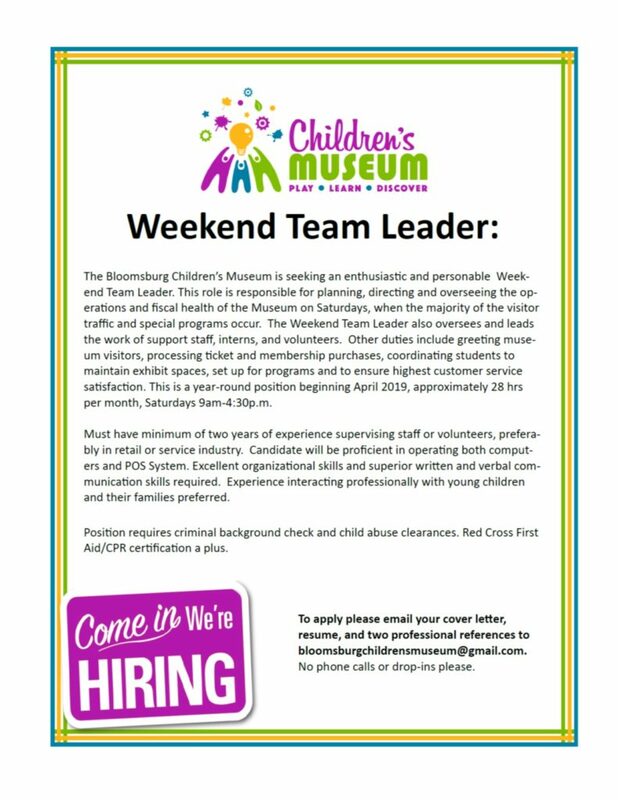 Contact us to learn more about interning with The Children’s Museum. 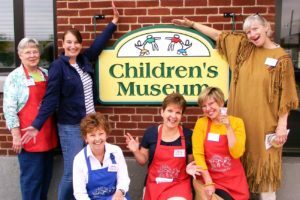 At the Children’s Museum, we get excited about adding new talent and enthusiasm to our museum team. If you are attending Bloomsburg University (or another nearby institution) and are eligible for Federal Work Study as part of your student financial aid package, contact us about available work study positions. The museum does the most hiring of work study students prior to the start of the semester.